Romance is back! – WHO KNEW? Since it is Veteran’s Day Nov. 11, this post seems to be getting very popular again. I love the story behind the image as much as I like the image. A powerful moment captured on film, timeless and timely. Glenn Edward McDuffie knows why the sailor kissing a white-clad nurse in that famous photo has his wrist bent back in an awkward position. Taken August 14, 1945 in New York City’s Times Square moments after the crowd there heard World War II had ended, that photo has epitomized the jubilant mood of a nation who had won our hard fought victory. Glenn knows why that sailor has his wrist twisted because he is that sailor. Glenn had come to New York after coming off the SS Alexander Lillinton with Jack Holmes (from Pittsburg), the sailor in the dark uniform seen laughing in that same photo. Glenn also knows the sailor in the white uniform’s name is Bob Little from Buffalo, New York since he also served on the same ship. Glenn McDuffie’s chivalrous act is the only explanation that makes sense when one views the photo. Not only does Glenn know why the strange hand position and the names of every sailor in the photo, he is the only man claiming to be the “kissing sailor” who has taken and passed a lie detector test on that subject. In fact, Glenn has passed 10 polygraph examinations proving his claims of being the man in the photo are truthful. In September 1980, he took two polygraph examinations administered by Smiths Security Agency for ABC Channel 13 (Houston, TX) at the behest of reporters John Davenport and Marvin Zindler. On February 14, 1981, the took a series of five tests, all by different operators, for F. Lee Baily’s syndicated Lie Detector show. Finally, on August 13, 2005, David Raney, Houston’s premier polygraph expert tested Glenn, and he passed with flying colors. Raney has a large poster of the famous photo in this lobby, signed by the man he is certain is in the photo: Glenn McDuffie. Glenn was shipboard in the middle of the Atlantic on August 27, 1945, when the photo of him and the nurse in a jubilant embrace came out in print for the elated American public. Glenn never saw it till years later. During the summer of 1945 he was more worried about whether his brother, Willie Durant McDuffie, would be liberated from the Japanese. Over the years, McDuffie has tolerated men who did not know the names of the other sailors in the photo and who did not pass, or even agree to offers, of lie detector tests, making frivolous claims they were the man in the photo. None of these men even mention the chivalrous bended hand to show the nurse’s face. This plausible reason for the pose proves his first hand experience that day. The only man who knows everything about the photo is a hero who fought for our country and deserves his due. The young nurse held out her arms right after hearing the war was won and Glenn McDuffie delivered a passionate kiss, chivalrously twisting his hand to show a photographer her face. This country owes Glenn some chivalry now. Original post. Romance it dead. 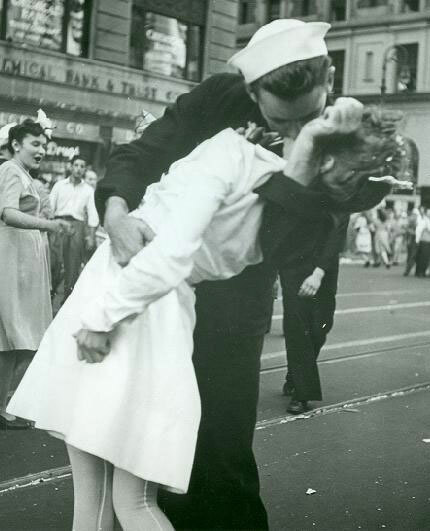 This photo is not as romantic as you think… On August 14, 1945 the news of Japan’s surrender was announced in the United States, signaling the end of World War II. Riotous celebrations erupted in the streets, but perhaps none were more relieved than those in uniform. Although many of them had recently returned from victory in Europe, they faced the prospect of having to ship out yet again, this time to the bloody Pacific. Among the overjoyed masses gathered in Times Square that day was one of the most talented photojournalists of the 20th century, a German immigrant named Alfred Eisenstaedt. While snapping pictures of the celebration, he spotted a sailor “running along the street grabbing any and every girl in sight.” He later explained that, “whether she was a grandmother, stout, thin, old, didn’t make any difference.” Of course, a photo of the sailor planting a wet one on a senior citizen wouldn’t have made the cover of Life, but when he locked lips with an attractive nurse, the image was circulated in newspapers across the country. Needless to say, “V-J Day” didn’t capture a highly anticipated embrace by long-lost lovers, but it also wasn’t staged, as many critics have claimed. In any case, the image remains an enduring symbol of America’s exuberance at the end of a long struggle. My question is were is the nurse? And who is she? Love only Love. Do Not want anything. I never noticed the older woman in the background before…now I know why she is smiling! Oh, that’s such a cool story! Thanks for sharing it.